We finally posted our “finished,” or not so finished, pieces to CommentPress. Because our site is not open for public view quite yet, I’d like to share my piece–my subchapter–titled “The Unfinished Text: Writing Digitally” here. I hope you enjoy it and, please, let me know your thoughts! The Digital Age is creating a new kind of text: the unfinished text. The unfinished text is specifically a digital text—a book or essay on CommentPress, like this one, a website, a blog, or a similar medium—that allows the author and the readers to continually participate in the text. As Kathleen Fitzpatrick states in Planned Obsolescence, the reader’s ability to comment and include links in her comments as well as the author’s “versioning,” or revising, the text are characteristics commonly associated with the digital text (Fitzpatrick 24). The digital text’s finality is continually deferred because the author can continually revisit, revise, and “update” her text and because the reader can contribute to the text through her comments and hyperlinks to other texts. Therefore, the digital text is unfinished by nature; it is never a closed “book,” but a text that can continually be updated. Importantly, the unfinished digital text is distinguished from a published, printed work. While the author can make changes to the work, her changes are not immediately seen by her audience. Several steps must be taken before her changes are publicized. Changes in a printed text need approval from the editor and publisher and, once approved, exist in new editions. When that occurs, the public must wait a certain amount of time before they can read the revised text. Importantly, to keep up with the changes in the text, the audience must continually buy the text’s new editions. Because a published, printed work cannot be easy revisited and revised by the author with the audience’s knowledge, the work seems “final” or “finished.” The reader assumes that when she picks up a book at the library or buys a book from a bookstore that the text “is present in its entirety and will be consistent from copy to copy” (Fitzpatrick 24). She believes that it is in print because the author, her editor, and her publisher believe that it is ready to be seen, that it is “perfected.” On the other hand, “rather than assuming the text is fixed, complete, and stable, the reader of a digital text may well assume otherwise” (Fitzpatrick 24). The reader of a digital text knows that the digital text is unfinished because the digital text can be indefinitely revised by the author and by the reader. The unfinished text is changeable so it is “imperfect.” The unfinished digital text is “perfectly imperfect” because it can be continually revised. In order to analyze the unfinished text, one must turn to the origins of the digital text. While creating this CommentPress book, my Digital Humanities class expressed concerns over the public drafting of our essays. We were afraid that someone would look at our very rough drafts and confuse them for our final drafts, a final expression of our thoughts and research on a particular subject. Some began their drafts with disclaimers saying, “This is only a draft!” or “I am still working on this piece, it is not finished.” Others “concluded” their drafts with promises for additional information. I also found myself embarrassed and feared that I would be judged simply because I did not notice that in my first posting I accidentally wrote an “is” instead of an “in,” changing the meaning of the sentence. Our concerns stem from our beliefs that our writing needs to be finished, or as close to finished as possible, in order to make it public. However, we did not take into consideration the accepting nature of the unfinished digital text. Because a digital text is unfinished, it accepts and welcomes revision. In other words, like the Digital Humanities has always embraced failure, the digital text accepts and welcomes failure. Writing is a trial and error process, especially when it comes to writing a digital text. We must accept that our first draft, just like our last draft, should not be perfect. The process of revision is a process that rebuilds, revamps, and redoes what has been done before. It understands that what has been done before might have been incomplete in some way, however slight. Similarly, what is revised or corrected may be revised or built upon later. Thus, should we be hesitant to submit our very (very) rough drafts for public view? Our fragile egos and self esteems would tell us yes, but the Digital Humanities would tell us no. In Planned Obsolescence, Kathleen Fitzpatrick encourages herself and other writers of the digital text to “expose some of our processes in public, to allow our readers—and our colleagues—to see some of the bumps and false starts along the way” (Fitzpatrick 24). We are taught that when we write anything, our first draft should not be perfect. The same criteria apply when writing a digital text. Drafting is part of the writing process and we cannot be ashamed of it. If the digital text is accepting of our revisions, and consequently our failures, then we must be accepting of our own as well. Just as one needs to ask oneself about the “right” time to publish one’s work, one also needs to ask oneself if there is right time to stop writing and revising. If the text is unfinished, does that mean the author can never be finished writing, never be finished with the text? If this is the case, does the author’s continual relationship with her unfinished text hinder her from writing other texts? If our texts are going to continue to grow even as they’re published online, we’re going to need to be present in those texts in order to shepherd that growth—perhaps not forever, but certainly for longer than we have been with traditional print publishing (Fitzpatrick 24). If the author wants her work to be the best possible, then she needs to grow with her text once it is “published online.” Fitzpatrick acknowledges that the growth might not last forever, but should last longer than one’s connection with a print text. However, Fitzpatrick wonders if it would be a “bad thing” if authors of digital texts worked on them “forever” (Fitzpatrick 24). Perhaps if authors grow with their digital texts, they can be influenced to create other digital texts, opening more windows of opportunity for themselves and their readers. Whether or not the author stays with her digital text “forever,” there is always potential for its revision. There is always potential for the author to revise and for the reader to comment and share. The author’s decision to continue the text and fulfill its potential is “continually negotiated” (Brown “Published”) and depends on the author and her work. That being said, I will continue to “update” my unfinished digital text for the indefinite future. The author’s continuous revisions are helpful, and add to her writing and learning. CommentPress uses WordPress’ blogging engine (Fitzpatrick 34) and both systems give the author the ability to track the changes she has made to her work by day and time. The author can compare any two revisions to see where she added or deleted information. The engine highlights the author’s changes, making them easy to pinpoint. If the author wishes, she can restore a previous revision, making a previous draft visible to the public once again. In the above example, the print highlighted in pink (on the left) was drafted before the pink highlighted in green (on the right). If one zooms in on the picture, one will see that certain words are in a darker pink (on the left) and other words are in a darker green (on the right). The words that are darkened mark the changes that were made to those words during a revision. For example, in the previous (pink) draft I wrote “the digital text is accepting of revision” and “the digital text is accepting of failure.” In the later (green) draft I changed the phrases to: “the digital text accepts revision” and “the digital text accepts failure.” I deleted the extraneous words from those sentences in order to highlight the digital text’s accepting nature. Significantly, I did so after exchanging comments with a classmate on the importance of the digital text’s acceptance of failure. I discovered CommentPress’ and WordPress’ ability to browse changes by circumstance. While writing our subchapters, the authors of this chapter—“E-volving Publications”—met quite a few times to share ideas, express concerns, and ask for advice. In one of those meetings, I was updating the group on my research when one of my peers asked if I had “browsed my revisions” on CommentPress and suggested that doing so would be relevant for my subchapter. I had not, but decided to try it. When I finally did browse my revisions, I discovered that my classmate was right, it was useful. A writer can browse revisions on CommentPress or WordPress by finding the tab on the upper right corner of the editing page. 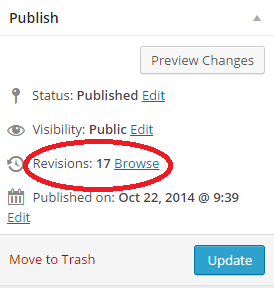 The tab displays how many revisions the creator has made and next to that number is a link to browse the revisions. Versioning preserves the history of the text, allowing it to live and breathe while maintaining snapshots of the text at key moments, as well as the ability to compare those snapshots, permitting readers to approach a text not just in a finished state, but throughout its process of development (Fitzpatrick 24). Versioning occurs in a digital text when the author revises her work in the public eye. Versioning allows the reader to see the writing as a process instead of a product. Likewise, when the author reads and “browses” her revisions on CommentPress, she approaches her writing like a reader. She becomes aware and conscious of the writing and drafting process. When she writes, she does not merely save the most recent version of her writing, forgetting about the previous version. Instead, the engine saves each version the author creates, allowing the author restore or analyze previous drafts, see where she revised the most, and correct changes she should not have made. The question remains: What does the ability to browse revisions on WordPress engines mean for the unfinished digital text? If the system behind CommentPress saves the author’s revisions, then the digital text is more than what is published or posted. The digital text also consists of the drafts and revisions the author makes while writing. Not only is the unfinished text defined by its ability to be continually revised, it is also defined by its readers’ participation. As Kathleen Fitzpatrick in “Networking the Field” states, when one writes online, one’s words are “subject not just to the scrutiny of a single evaluator, but to that of a broader group of readers engaged in thinking about the same questions” (Fitzpatrick “Networking”). When one writes online, whether for work or pleasure, one does not write for one pair of eyes only. Rather, one’s work becomes available to a vast group of readers who are motivated to participate in the digital text. Notably, reader ability to participate in a text is not a new idea. For example, in a print text, the reader can make marginal notes and comments, and “dog-ear” important pages. When the reader remarks on what is important in the text, the reader participates in the text. However, the reader’s comments and notes are only available to a small audience—the reader and with whom the reader decides to share them. Therefore, when the reader participates in a printed text, she adds to her knowledge and a select few’s knowledge of the particular text and its ideas. On the other hand, when participating in a digital text, the reader makes her “notes” available to the author and, potentially, a vast online audience. In her comments, the reader can ask the author questions and write suggestions, observations, or thoughts. She also has the opportunity to “share” the piece on social media or on her blog, opening up the text to a bigger audience. The author also has the opportunity to connect with the reader through comments. The reader’s comments might influence the author to view her piece in a different way or to make changes or additions to her piece. With digital texts, the reader and the author are connected in such a way that their conversation continually adds to and revises the work. Additionally, their conversation adds another way of reading the text because a third party—another reader—can participate in it, too. The potential for conversations about the text makes the digital text unfinished and creates potential for additional ways of looking at the text. The unfinished text, specifically digital texts within CommentPress, allows reader participation. In Planned Obsolescence, Kathleen Fitzpatrick discusses how CommentPress encourages reader participation. One of the unique features of CommentPress is the reader’s ability to comment on the text “at various levels of granularity, ranging from the document as a whole, to the page, all the way down to the paragraph” (Fitzpatrick 34). When commenting on a CommentPress text, the reader can comment on a single paragraph, a page, or the whole work. Therefore, the reader can point directly to the text in her comment. Likewise, the author’s attention is drawn to a specific page or paragraph where she needs to make revisions. In the same book, Fitzpatrick also discusses the way in which the digital text and the author’s text are placed “side-by-side” (Fitzpatrick 34). The author and the reader can benefit from this placement; they can reference the text without having to open a separate tab. Thus, reader participation is not only essential to the unfinished text, but is also welcomed in CommentPress’ digital text. Reader participation and comments were essential to this unfinished text—my unfinished text. Kathleen Fitzpatrick believes that collaboration, while writing the digital text, creates “better work, and a more enjoyable work process” (Fitzpatrick 25 italics not mine). Likewise, my experience with reader participation and comments influenced my work and made it enjoyable. 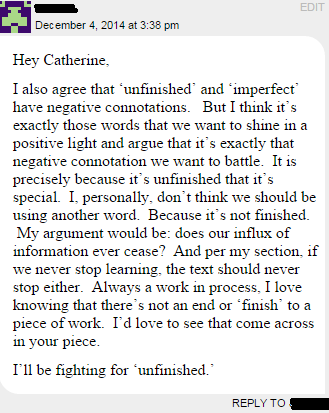 Specifically, quite a few my professor’s comments encouraged me to rethink the term “unfinished.” In her comments, my professor noted that “unfinished” has negative connotations and she asked me to try to make sense of them in my piece. I needed to question the use of my title and key phrase, “unfinished text.” Did this title accurately describe the digital text, or would some other phrase, like the “lifelong” text, be better? I realized that my paper needed to discuss the way the Digital Humanities asks its writers and readers to rethink terms such as “unfinished.” Why is the “unfinished” digital text a good thing? Similarly, why should the unfinished text be a good thing? My professor’s comments encouraged me to think about the phrase, “the unfinished text” not only in my title, but throughout my subchapter. As a result, I began to examine not only the digital text, but the phrase I was using to describe it. What does unfinished mean for the digital text versus the print text? Why is it important that the digital text is described as “unfinished?” What does “unfinished” mean in regards to the Digital Humanities? According in David Sewell in “It’s for Sale, So It Must Be Finished: Digital Projects in the Scholarly Publishing World,” the words “unfinished” and “done” (or finished) are contradictory when used to describe a printed text. A work that is unfinished is demonized, while a work that is finished is valorized. Similarly, a work that is unfinished is open and a work that is finished is closed (Sewell “It’s For Sale”). For example, when a print text is unfinished, its incompleteness is implied. One assumes that when a work is unfinished, there are key elements missing that, if included, would make it complete. There is also an assumption that completeness and doneness are the end goals of a project. On the other hand, the word “finished” has positive connotations. A work that is finished, or “done,” is “past, irrevocable, requiring nothing more and indeed immune from further action” (Brown “Published”). One assumes that if a work is finished, then it is a unified whole. Nevertheless, I still needed to decide if “unfinished” was a better adjective to describe the digital text than “lifelong.” I considered naming the digital text the “lifelong text” because of its connection to “lifelong learning,” as described by Cathy N. Davidson and David Theo Goldberg in “Pillars of Institutional Pedagogy: Ten Principles for the Future of Learning” (33). Although one can learn from the digital text throughout one’s life, a text must be unfinished before one can learn from it. One must know the ways the digital text is unfinished before one can be able to learn from it. For example, if the author knows how to browse her revisions, then she will be able to learn from her changes. If the reader knows how to hyperlink in her comments, then others will be able to benefit from the connection that the reader has created between texts. For these reasons, I decided to keep the original phrase—the unfinished text—and use it in my title. What if you were able to subscribe to a particular scholar, following her work over time and engaging with her as it comes into being? What if she followed your work as well, and the conversations you had around your shared work were able to produce more new collaborative projects? What if others were able to follow those conversations in process, providing additional input as you worked?…What if communities of scholars like this were able to say to one another the academic equivalent of hey, I’ve got a trunk of costumes, and we can use my uncle’s barn: let’s put on a show!? What kinds of performances might we develop on such flexible, dynamic communication platform? (Fitzpatrick “Networking”). The kind of Digital Humanist universe that Fitzpatrick describes is being created in today’s technological world. One has the opportunity to create a “platform” on social media, WordPress, CommentPress, and the like. Fitzpatrick reminds her reader that the texts one writes on online platforms are open to public view. If they are accessible, why not make them interesting, too? Why not make them collaborative? My professor and classmates did exactly what Fitzpatrick describes; they followed my progress, making comments and suggestions that affected the way in which my subchapter was written. In this way, my subchapter—and the unfinished text in general—are collaborative. Fitzpatrick’s last question becomes extremely important: if people can collaborate and communicate while creating the digital text, then what kind of text might they develop? Part of the answer is certain: if the digital text is collaborative, then it will produce better “performances” than a text that is not. When a reader comments on a digital text, she can also hyperlink to other websites, articles, blogs that she feels may be of interest to the author or other readers. Specifically, the digital text becomes the unfinished text because it is participatory. Readers add to the text when they hyperlink other texts in their comments. By hyperlinking in their comments, readers give the author another opportunity to revise her text and give their fellow readers an additional way of reading the text. For example, readers can use the hyperlinks to compare or contrast other digital texts to the one on which they comment. My professor made the above comment on one of my drafts. Specifically, she commented on a paragraph about the ability to track changes on CommentPress. 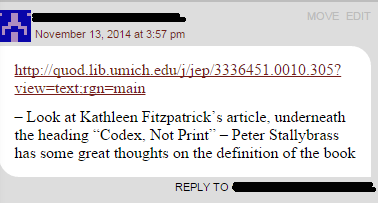 She recommended that I look at Kathleen Fitzpatrick’s chapter on CommentPress in her digital book Planned Obsolescence. Other examples are comments I made on my classmate’s drafts for their CommentPress subchapters. 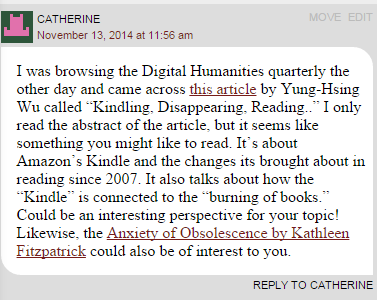 For example, on Nicole’s subchapter, “Digital Redefinition: Are Books Dying or Being Reborn,” I commented, including hyperlinks to Kathleen Fitzpatrick’s Anxiety of Obsolescence and an article by Yung-Hsing Wu about Amazon’s Kindle in hopes the sources would help her write her piece. My classmates also commented on each other’s pieces, including links to articles that might be of interest to the author. For example, in Nicole’s same piece, “Digital Redefinition,” another classmate commented, linking her to another piece by Kathleen Fitzpatrick. 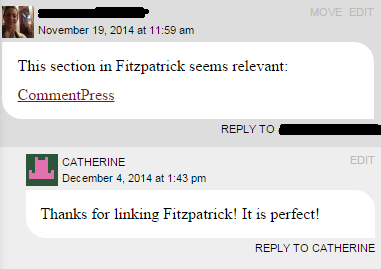 Why is it important for the reader to include hyperlinks in her comments? By hyperlinking other articles, readers literally link one article to another. When readers read a digital text and hyperlink it to another, they publicly interpret the text. By interpreting, the reader allows her fellow readers and the author to participate in the hyperlinked text. In essence, the unfinished digital text is characterized by the author’s work, the reader’s comments, the hyperlinked texts, and the conversations between them. In “Networking the Field,” Kathleen Fitzpatrick states, “The work we do gets better with practice, as more regular informal communication with one another leads to more meaningful formal communication, and a wider audience leads to broader engagements and better feedback” (Fitzpatrick “Networking”). One’s work becomes better with “practice”—revision—and “communication”—reader participation. The same can be said for the unfinished digital text. The unfinished digital text is made by “practice” and after that, grows because of more practice. The unfinished text is forever practicing; it can never be perfect. If the digital text were perfect, it would not be digital or unfinished. When considering the characteristics of the unfinished text, as Humanities scholars, Digital Humanities scholars, and readers, we need to ask ourselves a particular question regarding the “E-volution” of English Studies. The question is not, “Is the digital text ever truly finished?” After all, no text—digital, printed, or otherwise—is ever finished. Rather, we need to ask ourselves: Do we want the text to be finished? I hope, after reading this unfinished digital text, the answer is the same for you as it is for me. Brown, Susan et al. “Published Yet Never Done: The Tension Between Projection and Completion in Digital Humanities Research.” Digital Humanities Quarterly 003.2 (2009): n. pag. Print. Davidson, Cathy N., and David Theo Goldberg. “Pillars of Institutional Pedagogy: Ten Principles for the Future of Learning.” The Future of Learning Institutions in a Digital Age. Cambridge: MIT, 2009. 26-35. Print. Fitzpatrick, Kathleen. “Networking the Field.” Planned Obsolescence. N.p., 10 Jan. 2012. Web. 13 Nov. 2014. —. Planned Obsolescence: Publishing, Technology, and the Future of the Academy. New York City: NYU Press, 2009. Web. 9 Oct. 2014. Sewell, David. “It’s For Sale, So It Must Be Finished: Digital Projects in the Scholarly Publishing World.” Digital Humanities Quarterly 003.2 (2009): n. pag. Print. Today Dr. Elizabeth Dillon, co-creator of the Early Caribbean Digital Archive, is coming to campus to talk about the archive and discuss her new book, New World Drama: Performative Commons in the Atlantic World, 1649-1849. In order to prepare for her visit, my class was asked to tool around the Early Caribbean Digital Archive and come up with questions to ask Dr. Dillon. Being that my class is currently working on our CommentPress collaboration and specifically, being that I am writing my subchapter of CommentPress on the “Unfinished Text” it is extremely appropriate and convenient that Dr. Dillon come speak with us now. I hope to ask her about the most challenging parts of creating the archive, as well as when she and her co-creators decided it was time to make the archive open for public view. How did they know it was “ready?” Was its readiness predicated by it’s usefulness to their audience? How often did they have to edit the project and how often do they go back and revise, add to, or take away from the project? These question stem not only from my interest in the archive, but also my interest in the unfinished text that the Digital Humanities create. I would like to see if we can link the unfinished text to the archive as well as a digital book or blog. Likewise, I want to ask about her experience collaborating the project. On the most basic (and naive) level, I want to know how the collaborating worked when creating the project. How did they decide who did what and when it was time to work together? However, I’m not posting today just to voice my questions that I have for Dr. Dillon and the Early Caribbean Digital Archive. I’m posting today because something I came across in the archive reminded me of the topic of a couple of my posts a few weeks back. Google Maps. A few weeks ago my class had a presentation on how to use Google Maps for scholarship. We were also asked to find an example of a Google Map that was used for scholarship and evaluate it. If my memory serves me correctly, the Google Map I found was helpful, but not that helpful. It was actually a use of Google Earth to track changes in Concord Massachusetts. You can check out my post about it here. That being said, I found use of Google Maps in the Early Caribbean Digital Archive very, very successful. A student created a Google Map of Mary Prince in The History of Mary Prince. While I must admit that I’ve never read the narrative, the Google Map that racks her movements in the novel was extremely interesting. The student not only used the map to track Prince’s movement from place to place, country to country, but he also used the map to track the level of her agency in her movements. He color coordinated her movements to match the level of agency that existed in her movements. Each of her movements have an explanation attached to them and, citing from the text and interpreting it, he supported his claims for her level of agency in the move. Find his map here, along with another map of the ECDA Early Caribbean Slave Narrative Exhibit. I not only like the student’s Google Map on Mary Prince because of it’s neatness, transparency, and helpfulness, but I also like the student’s Google Map because it is a great use of using Google Maps to interpret texts. It opens up so many options (in my mind at least) on what Google Maps can do not only for scholarship, but for a student learning in the university. The student’s Google Map takes Google Maps tools, masters them, AND uses them to assist him in his OWN interpretation of the text. It’s a great model for the rest of us students out there who are looking for innovative ways to show our interpretations of the texts we read. As I was doing research for my paper on the unfinished text, I came across an article written by Jesse Stommel called “The Digital Humanities is About Breaking Stuff.” In it, Stommel talks about how the Digital Humanities “breaks” apart literature, so to speak. To support his claim, he cites examples from a Digital Humanities class he taught. One of the assignments he gave the class was to “break apart” Emily Dickinson poem “There’s a Certain Slant of Light.” In order to break apart the poem, his students created word maps, word drawings, and the like. The purpose of the assignment was to force students to look at literature in a different way. The result of the assignment was to open students’ eyes to the different ways of interpreting a text through the tools that technology gives us. His idea that computers and technology change the way we read and interact with literature is a significant part of claiming that the Digital Humanities is about breaking stuff. Stommel states that when we read a digital text we often become distracted by other stimuli. Because we might be reading a digital text on a smart phone, an ebook, a tablet, a laptop, or otherwise, we are invited to do more than just read the digital text. A reader can switch between his digital text and YouTube, or Facebook, or email, or a news outlet. Now, when we read, we are not simply reading the text at hand. We are reading the digital text and more. The “more” influences our interaction with the digital text. In essence, the age of technology has allowed us to multitask; it embraces distraction. “The Digital Humanities is About Breaking Stuff” is a digital text and fittingly so, it is multi-modal and gives its user access to links such as websites and videos that exist outside the article. In his discussion on multitasking and reading digital texts, Stommel links his argument to a YouTube video, a brief talk given by Cathy Davidson from Duke University about her book Now You See It. In it, she discusses the way in which this new great shift in learning–technology and the internet–is forcing us to multitask. She states that we often multitask and we don’t even know we’re doing it. She quite literally tells us to calm down. There is nothing wrong with our digital age, nothing wrong with multitasking. In fact, she states that when we find ourselves mutlitasking or becoming distracted when using technology, we should ponder on that distraction. She views distraction in our digital age as helpful. Technology is reshaping the ways in which we think and the ways in which we learn. Instead of being afraid of distraction, we need to embrace distraction and understand how it can be useful in learning. As for my opinion, I’m not sure how I feel about our “shifting attention” and technology’s influence on it. I’m finding it hard to understand how multitasking can be productive rather than confusing or overwhelming. I’ve always been taught to “do one thing at a time.” However, I’ll follow Cathy Davidson’s advice and pay attention to the times I’m multitasking and when that multitasking is helpful. I encourage you to do the same. I have exciting news, my Digital Humanities class is putting together a CommentPress book. We’ve been collaborating on the topic for the book for the past few weeks and finally narrowed it down to three subtopics: Digital Humanities and New Texts, Digital Humanities and Pop Culture, and Digital Humanities and Pedagogy. We split up the class into three groups, based on the subtopics. I joined the group writing about DH and “new texts.” In our initial group meeting we brainstormed the topics for our papers, discussed important research questions, and promised to collaborate and help each other in the research and writing process. Of course, we have a lot more brainstorming, researching, and writing to go, but I decided to share some of my initial brainstorming with you. I’ve been thinking about the title of my own piece, hoping that it will help generate new questions and ideas. I’ve come up with: “The Unfinished Text: Lifelong Learning in Digital Literary Studies.” Note that this is a working title, by no means do I expect it to be the final title of my paper. I expect that as I do more research and begin to write, other ideas will surface. For now and for my initial purpose, however, the title works. I’ve noticed a trend in many of the digital humanities works that I have been studying this semester. Many of the works discuss the idea of the “unfinished text.” In other words, digital English studies have created the “unfinished text,” or a text–whether it is a digital book, essay, or blog–that can continually be revised. Digital texts allow the author or authors to revisit the text again and again, and make changes at their own convenience. This is different from published printed works, because although the text is able to be edited, it is only done so with approval and with the addition of a new published “edition.” Also in the digital text is the audience’s ability to participate in the text. Whereas in a print text the reader is able to make marginal notes, in a digital text the reader can make his “notes” available to the author. In other words, the reader can ask the author questions, make suggestions or observations in a comment thread. The author then has the opportunity to connect with the reader, to answer her questions or to “comment” on her “comment.” With digital texts not only are the author and the reader connected, but they are connected in such a way that their conversation continually adds to the work. Their conversation adds another layer, another way of reading the text that the another reader can participate in. The ability of the reader and author to converse and the author’s ability to continually edit (or “update”) his work results in the unfinished text. The text’s finality is constantly deferred; it is never finished. It is never a “closed book,” but a “text” that can be continually updated. I believe that the unfinished text results in “lifelong learning.” In other words, because the text can never be “finished” in the sense that it cannot be added to, the text continually teaches the reader new things. I did some preliminary research on this topic in hopes that other sources can help me think more clearly through my topic. Here is some of the research I came across, all which–in some sense–deal with the idea of a continually revised text. In keeping with the collaboration theme in my last few posts, I decided to share with you an overview of my class discussion for Amy E. Earhart’s “Challenging Gaps: Redesigning Collaboration in the Digital Humanities.” There are three important points in her essay that I found most interesting and plan on sharing with the class. They are as follows: collaboration as a science laboratory, challenges which collaborative work presents to the humanist, and graduate student participation in collaboration. 1. After expressing the important difference between interdisciplinarity and collaboration, Earhart states a way collaboration can be seen in the digital humanities: like a science laboratory. Collaboration in the digital humanities is analogous to a science lab because both work in similar ways. For example, according to Cathy Davidson, labs are “built around the process of discovery” (31). In other words, the purpose of a lab is to experiment, test, and discover the new. However, at the same time, labs are also a place which research is shared across generations and various fields and disciplines (31). Therefore, labs are places which past knowledge is used and embraced and new knowledge is sought after. Most importantly, in the lab, “no solitary thinker—no matter how brilliant or creative—could think through a complex problem as comprehensively as a group of thinkers from different fields…areas of expertise…intellectual generations” (31). Like a lab, multiple participants/authors/contributors are necessary in digital humanities project collaborations. The knowledge that the participants have is vast; they often come from different fields, experiences, training, and educations. Therefore, each participant has something unique to offer the project. Because the participants have something unique to offer, they are able to contribute more to the project than an individual, on his or her own, would. However, Earhart uses the analogy of the lab loosely, claiming that the science lab contains hierarchies. (Hierarchies are not welcome in collaborations; if there are hierarchies then collaboration would not exist because collaborators are equal players.) First, there is a division between “technical and intellectual labor” (31). In other words, intellectual and technological labors are not equal players in a scientist’s lab. However, in a digital humanist’s lab they must be equal because both are equally important contributors to the project. She also claims that the science lab has a history of excluding women and minorities from their research, which also indicates an unequal players. Notably, she uses the Walt Whitman Archive as an example for the digital humanist’s lab, claiming that the archive is treated “as a laboratory” that “generates collaborative scholarship” and “trains future scholars” (31). In other words, she views the archive like a lab because the website’s contributors collaborate to create new scholarship at the same time their archive influences future Walt Whitman (and digital humanist) scholars. I find her discussion on the laboratory to be an interesting one because it uses an essential element of the sciences and attaches it to the digital humanities. In essence, it bridges the gap between the two fields, suggesting that the digital humanities lab is a technological one. 2. Another aspect of Earhart’s essay that I found enlightening is her discussion of the challenges which collaboration presents to the humanities, specifically the way humanists approach scholarship. Humanists generally work alone. When they are finished working, they present their finished product, not the process of achieving that product. Therefore, collaborations or “project partnerships” “run into problems that boil down to differing opinions of the position of the product or process to the project outcome” (34). For example, when humanists and technologists work together, their goals can clash. Earhart states that the humanist often “focus[es] on [her] immediate goals” (34) or results. The technologist focuses on the “application” (34). Earhart states that collaboration in the digital humanities is not necessarily about the finished product. Instead, the humanist should take a point or two from the technologist. The process of getting to the “final” project (if the project could ever be considered final) is “key to the discipline of digital humanities” (34). 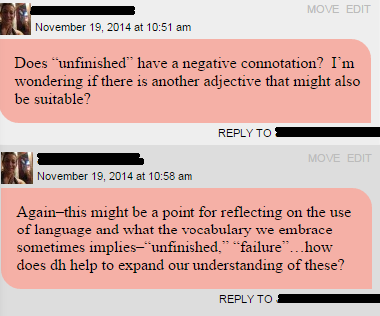 Failure is fine in the digital humanities. Failure can “produce more interesting results” or produce information that is interesting to publish (34). Thus the humanist, when working in collaborative digital projects, should value experimentation. I find this discussion on the challenges for the humanist interesting because it implies that the humanist is somewhat of a perfectionist. The humanist conducts research to complete a specific end. The humanist values the end goal, the result. Collaboration in the digital humanities values the result, as well as the cause, the process. The humanist needs to be more like the technologist and accept failure. Failure is a possibility in the digital humanities; one can learn from failure. I like the idea that failure is useful. 3. Finally, I am interested in the way in which graduate students can use collaboration in their own education and research. Earhart claims that graduate students are “the future of digital humanities” (40) and because of that they should understand and participate in collaborative projects. Earhart returns to the idea of collaboration as a laboratory, claiming that it is helpful to think of the graduate student and digital humanities in that context. The digital humanities laboratory gives the student room to decide how she wants to involve herself in a project. It also gives the student the power to decide create her own “piece” of that project (40). In other words, the lab not only teaches a student how to participate in a project but allows her to decide how she wants to participate in that project. Importantly, the laboratory model creates a different relationship between faculty members and students. In a collaborative project, the parties are interdependent; they share scholarship and exchange ideas (40). In essence, they teach and learn from each other. This kind of laboratory and relationship can only occur if there is a collaborative environment in education. I am interested in this idea because it relates collaboration and the digital humanities back to us—graduate students. It gives us a hint—but only that—of what collaboration could look like in higher education. Last week we discussed the setbacks of the Walt Whitman Archive, specifically the colorless website, the difficulty maneuvering through and finding information, and its similarity to a printed book. Considering this, do you agree that the Walt Whitman Archive is an example of a digital humanist’s lab which generates “collaborative scholarship” and trains “future scholars” (31)? Can the Walt Whitman Archive be an example of a laboratory when it is difficult to maneuver and is more like a printed text then a digital one? At the conclusion of her essay, Earhart states that the end goal of the digital humanities should be to create “a discipline where digital is represented within the term humanities” (41). What does her goal imply? Can we imagine what that kind of new system can look like? Would there be any similarities to the system in place or would that be completely erased? This week’s “weekly create” is to play around with a tool of our choice. Since I wasn’t too thrilled about Docuburst (see Docuburst is Bursting with Information?) I decided to play around with a tool that is much more comprehensible and helpful. Ladies and gentlemen, I would like to introduce you to Voyant! Voyant is a tool that allows you to copy and paste text or upload a document. Voyant takes the text you give it and creates a word cloud from it. The word cloud contains the words that are repeated most throughout the text. The larger the word, the more often the word appears in the text. I have to be honest though. This wasn’t my first time using Voyant. I’ve looked at Voyant before and created one or two word clouds to test it out and see how it worked. However, it was my first time using Voyant for academic purposes and that is what I want to talk to you about. The first thing I noticed was that to, and, that, of, & in are used the most in her work. While knowing this information has the potential to be helpful, it wasn’t the kind of information I was interested in. If I had time (and the patience) I could have gone through her work and deleted every to, and, that of & in. Doing that would have narrowed my search results to the important words, the words that express her main ideas. Instead, I worked with what I had and looked for the words that were slightly smaller in the word cloud. Those words included humanities, digital, project, work, and collaboration. Since Voyant not only gives the user a word cloud, but a list of how many times a word is used in the work, I was able to see that although collaboration is the main idea of the work, it is only used 38 times whereas the word “humanities” is used 84 times. Interestingly, the word “we” is used 58 times, which suggests the author’s openness to collaboration and teamwork within her own work. The information Voyant gave me was helpful because it highlighted what I should pay attention to in Earhart’s work. It also provoked questions about Earhart’s work and ideas that helped shape my discussion. In essence, it practiced “distant reading” so I could close read better. For class this week I am in charge of leading a discussion on Amy E. Earhart’s essay “Challenging Gaps: Redesigning Collaboration in the Digital Humanities.” Because I found the piece to be enlightening in terms of digital humanities work, especially collaboration, I decided to share a brief summary of her work with you. Earhart begins her discussion on collaboration in the digital humanities by explaining why collaboration is important for the digital humanities. She states that at many universities in the United States, specifically Texas A&M, are creating a “master plan[s]” (27) for “research, teaching, and service … that makes explicit that our scholarly production addresses the ‘grand challenges of society'” (27). In other words, universities like Texas A&M are beginning to set goals for themselves that will determine the ways in which their research, teaching and service connect to the “bigger picture,” or society. Collaboration, Earhart claims, is a part of these master plans. In fact, not only is it one part, it is the “key criterion” (27) which suggests that it is necessary for these universities. In order to understand collaboration and how universities may use it, Earhart expresses an important difference between “interdisciplinarity” and collaboration; interdisciplinarity is not the same as collaboration. To say that a project has multiple disciplines and multiple authors is not always the same. Importantly, Earhart notes that interdisciplinary studies are currently “alive” or exist within the humanities whereas collaboration is not as widespread. Also importantly, Earhart refers to collaboration as a “looming issue” (29). It is not an “open and shut” case because it can occur in so many ways, yet contain so many challenges. There are specific parts of collaboration that Earhart addresses in her essay. Specifically, she addresses a main concern of humanists when it comes to collaboration: ownership. She refers to the question of ownership as an unresolved tension in collaboration. How does ownership in collaboration work? In the current academic system it is often the case that more than one author to a work doesn’t seem “scholarly.” She implies that if the current system was replaced with one that rewards joint work then it may ease (or erase?) the tension. Notably, Earhart claims that the traditional humanists who reject digital humanities,also reject collaboration because of the question of ownership. The question of ownership may also be eased if collaboration were seen as analogous to a laboratory model. The laboratory model is helpful in terms of collaboration because it emphasizes new discoveries at the same time that it emphasizes research that is shared throughout multiple generations. However, Earhart warns us to not rely too heavily on this model because sciences often don’t include women and minorities in their research. She cites the Walt Whitman Archive as an example of a collaborative/lab model in the digital humanities. She then touches on the issue of funding in collaborative digital humanities projects. There are two ways that digital humanities projects can be funded. Institutional centers that give support such as funds, skills, and equipment (33) is one way. For those who do not have access to institutional centers, there are project partnerships. However, these project partnerships can pose problems for the humanist. For example, humanists and technologists approach research and scholarship in different ways. The humanist may focus on the goal of the project or the project’s outcome, while technologists may be interested in the technological application in which the project takes place. Earhart notes that the project partnerships will be successful if both parties focus on the process of the project. After all, the process is what makes a difference when it comes to the digital humanities. Humanists that are working within the digital humanities should focus on experimentation. Importantly, Earhart wants to “restructure” the collaborative group to include those inside and outside academia. In other words, one does not always have to collaborate with those inside the academic system. There are two external partnerships that can take place. One incorporates the academic project with business and museum/library interests. Her example is the 19th Century Concord Digital Archive. Another is the open source community. The open source community can be helpful because it invites participation from the open source community (which in other words, refers to those knowledgeable within the community but are not considered academic professionals). Earhart suggests that help from open source communities can and should be taken. She compares this to Richard Miller’s idea of “boundary objects” (37). An example of an open sourced collaborative project is BBC’s Backstage movement. What is most important to Earhart’s discussion is her belief that a professional working on a collaborative project should be knowledgeable about the fields of the other professionals with whom she is working. Earhart says that the professionals collaborating should be “equal players” (38). If the professionals are equal players then they will be able to understand how the disciplines affect the project and therefore understand the project better. Also, the professionals must not only be able to share knowledge, but share project space. Finally, Earhart concludes her essay by thinking about collaborative projects and the graduate student. She states that collaborative projects may be helpful to college students. A lab collaborative project can allow the student to decide how she wants to participate in the digital humanities project at hand. As Earhart states, it can “give students power to develop their own piece of a project” (40). Therefore, students will not only help with the project, but they can contribute to the project as well. Importantly, if the graduate student is involved in a lab collaboration, then a new relationship occurs between the student and the faculty member. Their relationship becomes a interdependent one; they learn from each other. Kenneth M. Price in his article, “Edition, Project, Database, Archive, Thematic Research Collection: What’s in a Name?” , uses an archive he collaboratively created as an example of how “archives” are much more than what that title or other titles (edition, project, database, archive, thematic research collection, etc.) suggest. His “archive,” the Walt Whitman Archive, encompasses a vast array of Whitman’s material–that which Whitman published in a multitude of mediums as well as Whitman’s manuscripts. As Price states, such a collection is ongoing, it’s not a project with an end, but one that is an ongoing. The process takes many, not just one, contributors which makes the “archive” collaborative. In light of these characteristics of the Walt Whitman Archive–and all “archives” like it–Price suggests uses a different term to describe the collection: an “arsenal.” An arsenal’s emphasis is on the product and the process to get that product. In other words, an arsenal, like the Walt Whitman Archive, is a workshop. Is the purpose of the site/project/archive clearly articulated? I have never worked with an archive before so upon entering the Walt Whitman Archive I was unsure how to navigate. Luckily, the site is easy to navigate. The title of the site is clearly visible, along with the names of the editors–Ed Folsom and Kenneth M. Price. (The two editors make this site a collaborative project.) There are various tabs along the left-hand side of the page which indicate the various categories of the site. One has the choice of visiting Whitman’s published works, works written in Whitman’s hand, his life and letters, commentary about Whitman, pictures and sounds of Whitman, other resources, and an “about page.” My only criticism is that this “about” category is placed at the bottom of the list. Ideally, it should be placed at the top so that the scholar, the student, or even a reader of Whitman could learn more about the site and how to navigate it. The reason I suggest this is because that “about” tab has a link to a tour of the site. The tour of the site explains what the user will find in each category and gives examples of the kinds of material that they will find there. This is extremely helpful for a new user to the site as well as a new user to digital archives. This about page also clearly articulates the purpose of the site: to digitize Whitman’s work and writings so the scholar, the student, and the reader may have access to them. Your next question might be, is the site easy to navigate? Is the “tour” necessary to the site or can I figure out the site on my own? My answer would be yes, even without the tour the site is easy to navigate. Each category/tab/section contains information that is relevant to each tab and information that is easily reached. For example, if one clicks on the “Published Works” tab, one will be given options on where to search next. From there, if one chooses to go to “Books, by Whitman” then one will be given more choices. Does the user want to see the Leaves of Grass editions or his other works? Essentially, the site narrows down your search for you, giving you options that are clearly defined for the best search result possible. The Walt Whitman Archive claims that its use is for the scholar, student and reader. It’s accessibility to students/ teachers and readers is one of its strengths. Because it is accessible to the general reader, the Archive shares the humanities (and the digital humanities) with a much wider audience. The Archive assumes that not only are humanities scholars and students interested in literature, but that the general public is as well. What is being done in this project that cannot be done in print based scholarships? To answer this question I would like to take a moment to discuss the Leaves of Grass editions that the archive makes available. If I were studying Whitman’s Leaves of Grass and wanted to track the changes in its various editions without using the digital archive, I would have to buy or rent from the library all of the previous editions of the book. If I did that, I would be surrounded by books, flipping through page after page (sounds like tedious work to me!). Instead of doing that, however, I can go to the archive where the editions are all in one place. The archive does the tedious work for me, it gathers the texts together, so all is left for me to do is search through the material and draw my conclusions. The Walt Whitman Archive is also searchable. If you type in a word, the search engine produces a list of links to where that word is used in Whitman’s works. This cannot be done in print based material because print based material is not searchable way that digital material is. If I were to look up a specific word I would have to carefully comb through every page of the material in question. If I were to use the Walt Whitman Archive, the combing is done for me. How can one use it for one’s research? An important question remains, how can I use the Walt Whitman Archive? A general reader can use this archive for curiosities sake, or to increase their understanding of Walt Whitman. A scholar or a student can use the archive for the same purposes. Most importantly, they can use it to answer their questions, they can use it for their research. The usefulness of the Walt Whitman Archive is vast. The benefits of the information on the site is vaster. The site allows the user to clearly and easily comb through a vast amount of information that print works do not. The site allows the user to narrow down their research or to answer her questions with more questions. Most importantly, the Walt Whitman Archive allows one access. It allows access to information that might not have been available otherwise. In allowing access, it allows questions (and answers), and contribution to knowledge. It’s amazing what technology can do for the humanities and digital archiving is one great example among many.